I've never really had dry skin, not truly dry skin. Until I moved here to southern Idaho. Holy smokes! I look like a lizard! Humidity here has been, like, 0% for weeks. So I've been turning to body balms for some extra skin protection. Although you use body balms as you would a lotion, they aren't lotions. And, in fact, body balms and lotions are not interchangeable. They work on the skin in a completely different way. Because body balms aren't made with any water, you don't need to use a preservatives. A little bit goes a long way. Just take a dab and massage it into your skin. Like, everywhere--legs, elbows and knees, feet and hands. It also makes an extra nice cuticle cream. I pour this body balm into cute little glass containers that I found at the dollar store. It looks sweet and feels decadent on the skin. For that extra dry winter skin, this soothing balm is the perfect solution. I think the minty orange scent is super yummy, but feel free to sub out if you're not a peppermint fan. 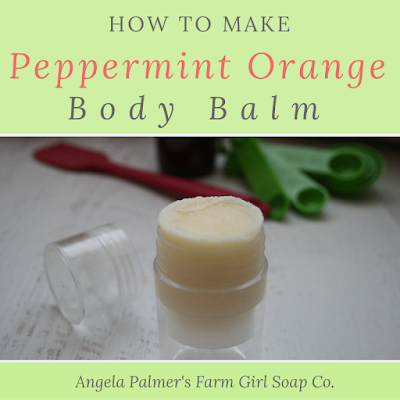 Lavender, eucalyptus, or rose geranium would all smell lovely with the sweet orange. To make: Measure out the shea butter, coconut oil, jojoba oil, and beeswax into a small bowl. Microwave for 15-45 seconds, until the oils are just melted. Add in the peppermint and sweet orange essential oils and mix well. Pour immediately into a small container. Let set undisturbed until it's completely cooled (about 3-4 hours) before you put on the lid. To use: The finished balm will be semi-solid but will melt on contact with your skin. Massage in as needed. Just a small dab goes a long way!